Easily view and export a summary of student learning progress by state learning standard based on logged observations. 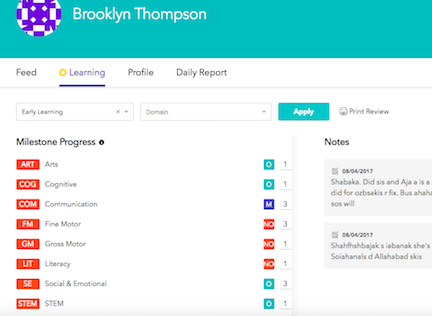 Teachers and staff can easily track the progress of a single student or classroom in both the mobile app and via brightwheel’s web platform. These reports are based on the Observations logged by teachers throughout the day and when logging through Lessons included in the week's Lesson Plans. This report allows staff to filter by student, student status, classroom, learning framework, and domain. This report can be exported to a CSV by clicking Export located to the right of the green Apply button. Click on the child's name, on the left of the Review chart. Use the filters to choose a Framework, Domain, or both.